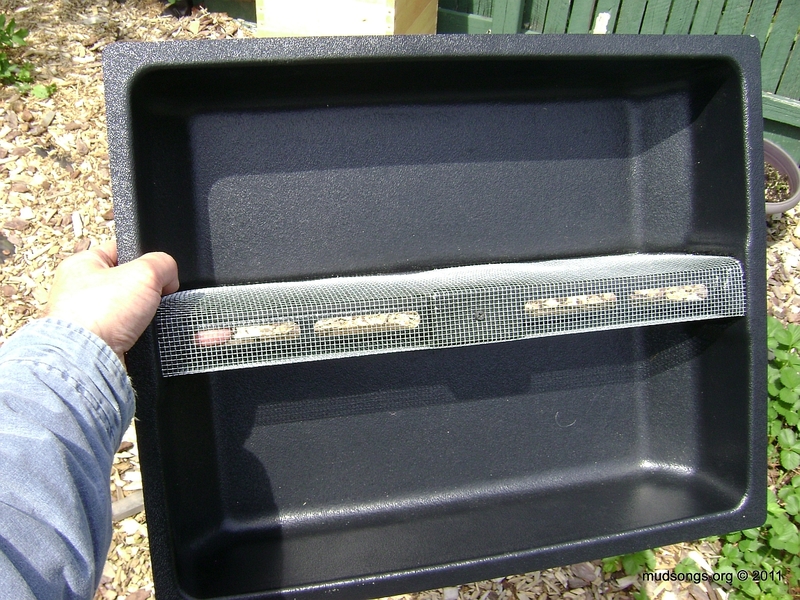 Plastic insert feeder (June 1, 2011). Insert feeders are still on the market, so I assume they must work for some beekeepers, but I can only imagine they work for fall feedings of fully established colonies, situations where the hive is already full of bees. An insert feeder, or a disaster waiting to happen for nucleus colonies. The small number of bees in a nuc, on the other hand, aren’t as likely to access the syrup in an insert feeder because they can’t break cluster so easily. They need to stay put to keep the brood warm, and the syrup in an insert feeder is too far away. (That’s my best guess.) That’s why internal feeders close to the brood nest work so well for raising nucs. If the bees have to leave the cluster to get at the syrup, they don’t have to go far to do it. That’s simply not the case for insert feeders. Poor thermodynamics also play a part in this story, but the results are the same. A small cluster of bees cannot conveniently access the syrup from an insert feeder. 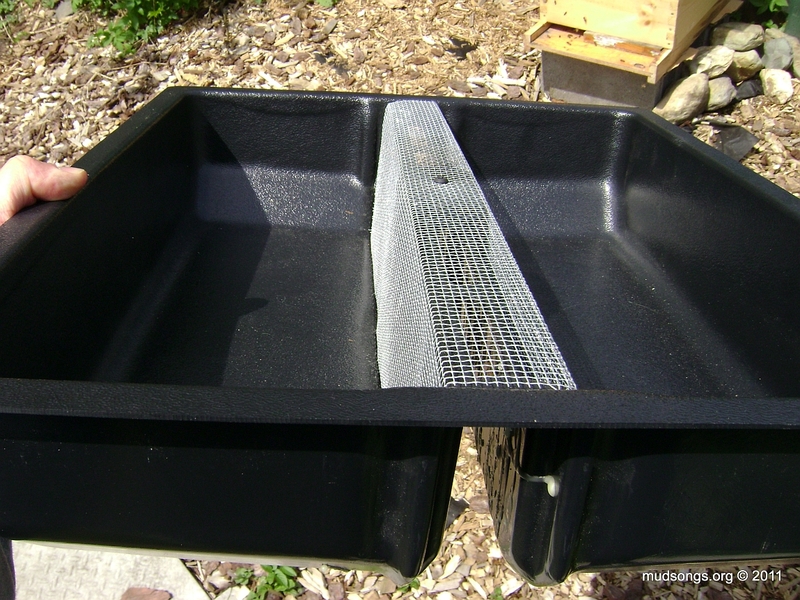 Some might disagree with me, but I’ve heard enough from other beekeepers and have seen enough direct evidence myself to believe that insert feeders should never be used for nucleus colonies, particularly in cold climates such as Newfoundland. 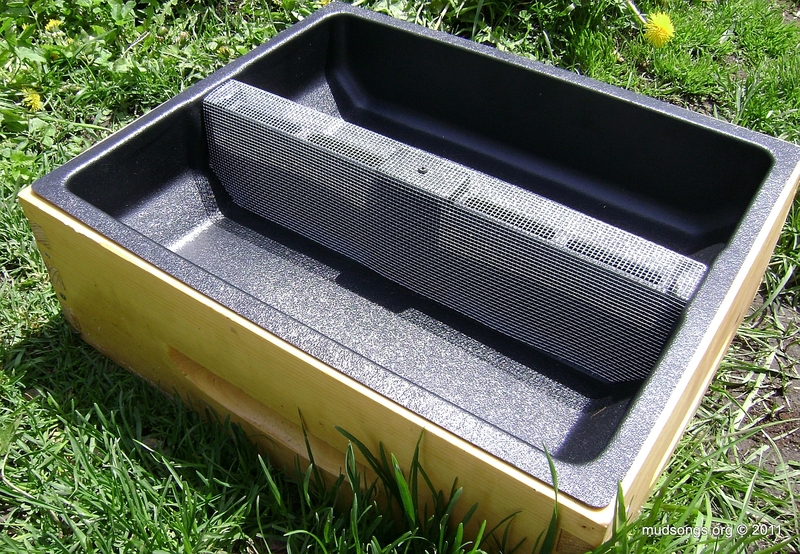 Most recently I saw an insert feeder on a novice beekeeper’s nuc and it was the saddest thing I’ve ever seen. He started the nuc about six weeks earlier and the bees still hadn’t drawn out a single frame of comb. The colony was queenless with no sign of brood, virtually no honey stores and no nectar or syrup stored in any of the cells. It’s possible the queen was already dead or injured when he set up the nuc, but whatever trouble it had, not having access to sugar syrup because of the damn insert feeder probably didn’t help. This entry was posted in Feeding, Insert Feeders, Month of June, Nucs, Queenless Colonies, Sugar Syrup, Year 2011, Year 2015. Bookmark the permalink.